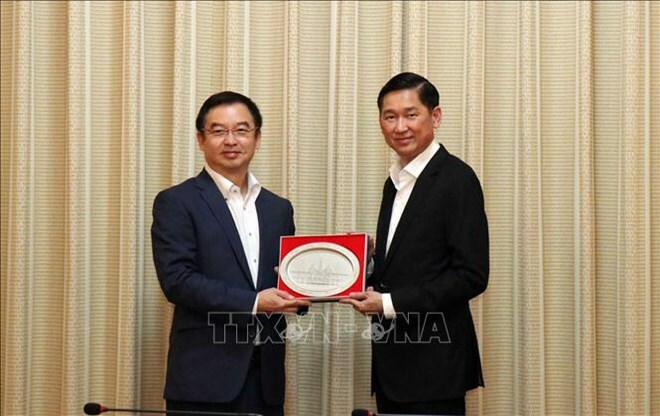 HCM City (VNA) – Ho Chi Minh City will create favourable conditions for Thai-based Kasikorn Bank (KB Bank) to open its branch in the city, the first of its kind in Vietnam, helping diversify local credit and banking activities, Vice Chairman of the municipal People’s Committee Tran Vinh Tuyen has said. Hosting a reception for First Senior Vice President at KBank Pattanapong Tansonboon on March 22, Tuyen spoke highly of the bank’s strengths in small and medium enterprise (SME) lending and digital banking services, and said that the bank’s development strategy in Vietnam is in line with the city’s orientations. He hoped that during its operation in the city, KBank will enhance cooperation and share experience in financial management and development of financial and credit services with Vietnamese partners. Pattanapong Tansonboon, for his part, said that the bank stands ready to share experience with the Vietnamese city in supporting SME development, handling bad debts, branching out digital banks and implementing cashless payment.